We are excited about this opportunity to partner with local churches and strengthen the relationship between the students and people from our local methodist communities. Every Wednesday night during the school year we serve dinner at 7pm prior to our 8pm worship service. There are 3 ways churches, small groups, sunday school classes, or individuals can contribute to the success of our Wednesday night dinners. Provide a meal. Simply prepare a meal or pick up dinner for our community and drop it off on Wednesday evening before 7pm. 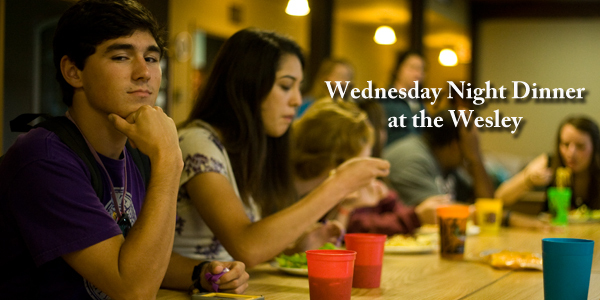 You are welcome to join us for dinner and/or worship and get to know some of our students, but are no way obligated to. We understand busy schedules so if all you can do is provide, we will love you just the same. As far as the meal is concerned, please provide an entree and two sides for between 30-50 people, along with dessert that we will enjoy after worship. 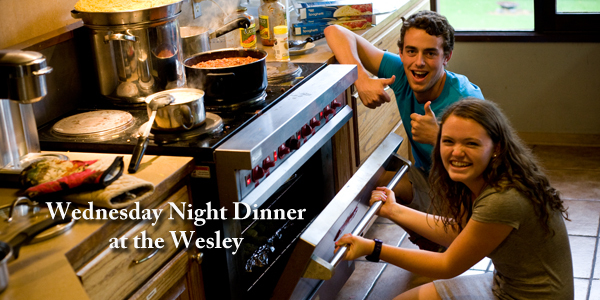 If you are interested, please click here to sign up for a date during the semester for our Wednesday night meals. Use the information provided below to log on to our TakeThemAMeal account. Share your cooking skills and recipes: There are students who love cooking and would love your help learning to cook great meals. So pick up the ingredients and enjoy an afternoon cooking with the college students. If you would like to cook with students, click here and sign up for a date to cook and then email Adam Darragh to prepare for cooking. Make a monetary donation: $100-$125 pays for a full Wednesday night meal. Please mail a check to the Wesley Foundation at LSU at 333 E. Chimes St. Baton Rouge, LA 70802. We are very excited about this opportunity to partner with our local churches and to enjoy great meals throughout the semester. Thank you for considering this opportunity to serve the students at LSU. If you have any questions please don’t hesitate to email Adam Darragh or call 225-344-7012.